An astigmatism is very common and is the irregular curvature of the cornea which decreases the ability to see fine detail. Headaches and eye strain after prolonged use of the eye are common symptoms of an uncorrected astigmatism. Hyperopic astigmatism: One or both principal meridians of the eye are farsighted. Myopic astigmatism: One or both principal meridians of the eye are nearsighted. Mixed astigmatism: One prinicipal meridian is nearsighted, and the other is farsighted. Advanced Surface Ablation (ASA) is a relatively new laser vision procedure used to treat myopia (nearsightedness), hyperopia (farsightedness) and astigmatism. It uses improved methods and has additional safety features over LASIK which makes it an alternative for patients who have been told that they are not an ideal candidate for LASIK. 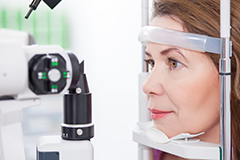 The ASA procedure is performed on the surface of the cornea instead of cutting a flap into a deeper layer. This preserves the structure of the cornea without weakening it and is a better option for those who have thin corneas.